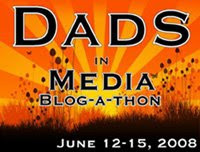 This post is part of the Dads in Media Blog-a-thon, hosted here on StrangeCulture. Ah, look at that lovely picture from the first season of 24, including it's season one star father Jack Bauer with his daughter Kim Bauer. The other day I mentioned what an incredible father Atticus Finch is, he's a likeable hero (maybe not to everyone in Maycomb County) and he's a great Dad at the same time. 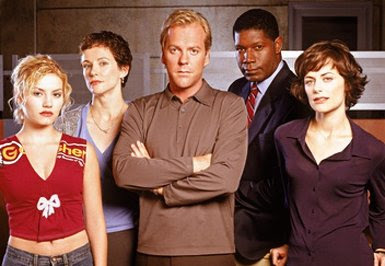 My wife and I love the television real-time drama 24 (only on DVD, never life on television), partially because it has it's own brand of intensity, complexity, return characters, and there's is something very admirable about the rebellious patriot that is...Jack Bauer. But when it comes to his father skills...he has one great fatherly trait and then a slew of strikes against him. His great trait (which is not to be undervalued) is his priority of physically protecting his family. Now, there's no need here to go into to many plot details, but if the bad guy wants to find a bargaining chip or find an escape, there's one sure fire way to get Jack Bauer to break rank and assignment, and that kidnap or threaten his daughter. Jack desperately wants to see his family protected. The problem...Jack is unwilling and unable to make premeditated decisions to protect his family. Granted, Jack is just a TV character, but to me there is a strong message in the Jack Bauer story. Kim Bauer is most involved in the first season, but her role, although changing has significance in many of the seasons to follow. Unfortunately, because of Jack's earliest decisions he makes, particularly in his career and role with CTU (Counter-Terrorism Unit) he places Kim and their relationship in danger. In the pre-story before season 1 even takes place, Kim Bauer is an unruly, rebellious teenager, who is able to take advantage of her parents marital struggles to achieve her own short-term gains. As things progress through the seasons there are many reasons for Kim to harbor resentment against her father...which she definitely does. I think that the analogy can be all too prevalent in many situations today. Sure most people don't have a father who's fighting terrorist across the globe, but there are certainly father's who will do anything for the kids and family in a crisis, but don't make good decisions for their kids and family pre-crisis. Particularly in the way they handle the marriage relationship and their professional life. Jack Bauer didn't protect his family by engaging in an affair with Nina Myers. By letting another woman in, one of his work associates, it created a devastating schism. Jack also willingly chose a dangerous career that put himself and his family in grave risk. His job provided for family needs, but failed to provide family stability. Jack also chose a time demanding career that often kept him away from home, not just for 24-hours at a time, but sometimes much longer, whether undercover on assignment, or kidnapped by foreign governments. Jack might be an All-American Hero, but he's hardly an All-American Dad. I heard someone argue once that if you actually had to live through one of Jack's days, your head would explode from the ceaseless tension. Jack is one of those dad's who a kid might come to appreicate when they are older and can understand and reason what motivates him, but who will never live up to what they want in a Father. He would also be the kind of Dad who gives a kid issues - hence Kim Bauer in 24.